Kay continued to come up with ideas and improvements for textile machines, and in 1733 he developed a wheel shuttle, later known as a flying shuttle. The flying shuttle was used for the traditional hand-loom and helped improve weaving efficiency and reduced labor needs because it could be operated with only one operator. In fact, the flying shuttle was the first device in the modern era that significantly improved the productivity and efficiency of the textile process. ​The flying shuttle was first manufactured in Essex, England. However, labourers did not like the machine, and petitioned to have it stopped, as it put their livelihoods at risk. This is likely related to the Luddite Movement that emerged in England during the timeframe of the Industrial Revolution. This movement opposed new technologies, which threatened the jobs of industrial workers. Kay improved his machine, and also developed other machines such as one for cloth ribbon weaving, and one for spinning. In reality, he made very little money from his invention and instead struggled due to copyright infringement of his original design. ​Kay left England in 1747 because France was known to support textile innovations. Kay sold his patent to the flying shuttle to French manufacturers and it allowed for the mechanization in French textile production which allowed the French to make lots of fabric and textiles to clothe the population. In return, he was paid an ongoing pension. Kay adopted France as his country, although he did visit England a couple of times during the 1750s. 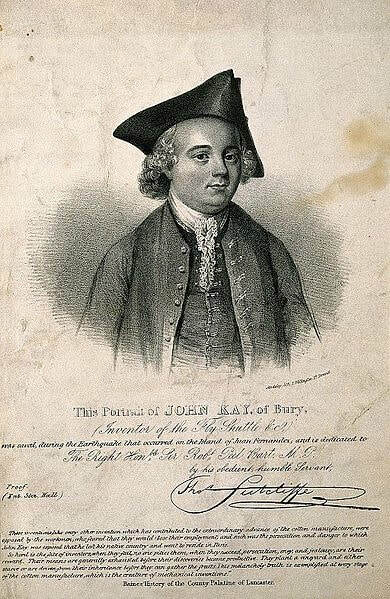 John Kay died in 1779. Today he is best remembered for his invention of the flying shuttle and the impact his innovation had on textile production during the Industrial Revolution.